The Speaker of the House of Representatives, Yakubu Dogara, has condemned the assassination attempt on the Deputy Senate President, Ike Ekweremadu, his wife and son, by gunmen. Mr Dogara made the condemnation in a statement on Tuesday signed by his Special Adviser on Media and Public Affairs, Turaki Hassan, in Abuja. He said as the general elections drew closer, security agencies in the country must ensure that lives and property of all Nigerians were secured and protected. "As the 2019 elections draws closer, the Nigeria Police and indeed all security agencies must ensure that acts of intimidation and coercion such as political assassinations are prevented. "There is no room for excuses anymore. The security agencies must be alive to their responsibility of securing the lives and property of Nigerians. "This is unacceptable. The police must ensure that the gunman and all those involved are not only apprehended but brought to justice. "As the 2019 elections draw closer, it is of utmost importance that the police and other security agencies deploy their intelligence to forestall wanton killings and other violent acts that are programmed to cause fear and panic among Nigerians. "These kinds of incidents must be nipped in the bud before they get out of hand. "I commiserate with the Ekweremadu family and pray that God will continue to keep them safe," Mr Dogara said. Gunmen had discreetly evaded the security at Mr Ekweremadu's Apo Quarters residence and gained entry into his house at about 4 a.m. on Tuesday, according to his Special Adviser, Media, Uche Anichukwu. "The attackers, who could not immediately shoot in order not to attract the attention of the security personnel on duty, took hold of his son, and commanded him to lead them to the senator's bedroom. "It was at the senator's bedroom that a struggle ensued, leading to the arrest of one of the assailants with dangerous weapons and housebreaking devices, while the rest managed to escape. "The arrested member of the gang has, however, refused to divulge any information on the operation and has been handed over to the police. 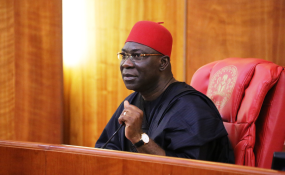 "Ekweremadu, his wife, and one of his sons were in the house at the time of the attack," Mr Anichukwu said in a statement in Abuja.